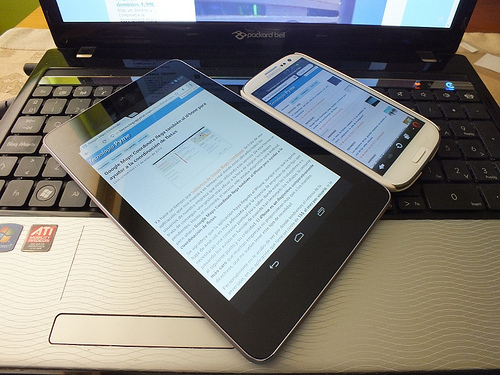 Me first: Is responsive design a distraction from good content? Is responsive design an interesting sideshow, taking up time and money that should or could be spent on basic readability and improving content? This is the debate posed by Malcolm Davison of the Writing for the Web agency in his blog post ‘Forget Adapting for Mobile‘. His post came after some discussion on the topic on the Content Strategy Google group (that discussion in this thread). The post contains some good points and a link to an interesting presentation with lots of good-looking stats about user behaviour across device. I can’t disagree that working on quality content is A Good Thing. HOWEVER (there had to be an however, right?) while I agree with the underlying point of the argument posed in the post I’m not sure I can completely agree that responsive (or adaptive) design should be completely pushed aside as unnecessary frippery. Since he posted earlier today there has been a lively thread running in the Content Strategy Google Group with practitioners trying to understand more fully the intention of the post and make their own views clear. If you’d rather you can dive straight into that thread here. So, where to begin? Well, how about with the evidence that forms the basis for the post? Looking into the Google research cited they state a number of points of context around how an individual may choose which device to use – the amount of time available, the goal or task in mind, location and attitude. They then add this context to each device (they use mobile to indicate smartphone, while laptop / PC are in together, tablets and TV). However, some critical thinking is needed around this research as there is little quantifying or contextual information about the data it presents. My thoughts that follow are based on assumptions of my reading of the research, the subsequent blog post and forum thread. Is responsive design a ‘nice to have’? I think 30% is pretty much the level of ‘mobile’ traffic that most local government sites are seeing at the moment. Unlike the report I use this as an accumulated figure of smartphone and tablet use. And I would question whether those devices are still used in the way listed in the report – for information on the go or to kill a bit of time (smartphone) and for entertainment (tablets). Why do I question it? Well, I don’t have a tablet but I do have a smartphone. My usage of that device is much higher than the 38% the report found, and I use it for everything. Am I unusual? Maybe. But that’s partly my reason for blogging about this! Of the other devices I have access to I could choose desktop or laptop (I’m discounting TV in my case – we don’t have an interactive TV and view it infrequently. I accept I’m probably the exception in that case!). Whatever I’m doing (away from my day job) it usually starts on my phone. If I have to move to another device to complete the task I do feel as if something has failed and that my user experience is poorer for it. And I have a choice. What about those that don’t? Is multiple device usage more common amongst urbanites than those in rural areas where broadband may be poor? And what about those from deprived backgrounds – maybe they have no device at all but if they do I bet it’s a smartphone. Some of the tasks suggested in Malcolm’s post I would have to switch devices for – but I’d feel let down by the provider that I did. I would want to be able to complete them all from a smartphone (or tablet) as that is my device of choice. And in the other direction, what about devices which aren’t widely used yet but may well become mainstream in the future? Wearable tech is out there now and there’s going to be all kinds of stuff we can’t anticipate fully right now. Is ‘mobile’ really just messy shorthand for ‘multiplicity of choice’? All of this is part of why responsive isn’t just a nice to have or buzzword of the moment. You can pay lip service to it but you could also make a real and long-lasting, even futureproof, change to the way you work your digital content; by separating out the presentation level (responsive / mobile design) from structured content (mark-up to define what shows where when). And what of serving content which is appropriate to the device? This isn’t really covered in the original post but, the thread headed off in this direction with some really interesting points around structured content and content mark-up as the way to serve the right content, in the right way, at the right time. There were lots of posts about doing this via a CMS and the use of DITA. There were some glib explanations and there were some techy descriptions of how structured content could and should happen in the background, how it fits with business objectives and even the practical impact storing content this way would have on authors. It’s the sort of discussion digital practitioners should probably have more (thinking of my own sector here, clearly discussions generally are happening) and in local government, perhaps it is time to help each other find ways that separate the presentation layer from the content, rather than letting technology define what we can or can’t do? Content first? Mobile first? User first? But how do we discuss this with the boardroom, the senior managers or elected members? They probably have no interest in hearing about the benefits of structured content. It’s a tactic that will help achieve an organisational goal. As with so many things it needs discussing in the right way. And maybe mobile (as defined in the thread – not really about smartphones or tablets but a messy shorthand for the multiplicity of devices now in play – with more to come, Google Glass and wearable internet anyone?) is the way to phrase this conversation. With stats that traffic is coming from other devices, research on how your audience is accessing, their expectation and ability, discussing implementing a responsive design or ‘mobile-friendly site’ is the way in. Is the original post wrong? No – it’s just one view which seems to look at presentation and content as one inseperable entity. In lots of people’s digital worlds – particularly around local gov I expect – that will be true. But there is another way and maybe we should be talking about that and moving toward it? Image ‘Portatil-tablet-smartphone’ by Miniyo73 on Flickr. Shared under the Creative Commons licence. Would love to hear thoughts on this – you can usually find me on Twitter or use me a comment below. And don’t forget <plug> you can my words about music over on Louder Than War </plug>. Posted in Content strategy, Mobile.Tagged adaptive content, adaptive design, content mark up, device strategy, mobile strategy, responsive content, responsive design, Responsive web design, structured content, writing for the web. Some great points in your post. One thing you didn’t mention is the effect Mobile Accessibility Guidelines might have, if content for all devices is treated as one. I don’t actually think content should be treated as one for all devices – I think it should be stored in one place in a structured way with mark up to denote what content displays how dependent on device. So, for example, you might get a shorter form of content with less /no images for mobile but mark up would allow you to denote this as a version of a longer, more image heavy piece, for display on desktop. I can also see use for different links to be displayed. For example, if someone came to a local government site for public transport journey planning and there needed to be links to an external service providing this (assume for a moment we can’t embed etc). On the desktop you’d want links to a desktop version to display, on smartphone you’d want smartphone specific links to display. I do think it’s misleading to think of ‘mobile’ purely as smartphone and tablet though (not saying you’re guilty of this Phil but think lots are!) – there are so many variations just within those two types of device and a whole imagination of new devices yet to come. As with everything I think it comes down to doing the best thing for user experience, knowing your users, knowing your content and making informed choices as a result. Yes, you’re totally right. which is why digital teams need to think about the design from a server side rendering point of view as well as client side. RESS certainly sounds like what I’ve been trying to describe! I guess it’s just another name I hadn’t learnt yet for the meeting of structured content and responsive / adaptive design practices – it’s useful to know that’s what to call it so thanks! Having now read your blog post I will be really interested to see how this works out on your new site, but also – wider picture – the pros, cons, costs and resources you found with the RESS route compared to any of the other paths you could have taken (assuming you can share that stuff). I guess that’s the stuff that the sector needs to know so as you’re out at the front of the pack all eyes to you for sharing! Perhaps it’s a case study we can amplify through LocalGov Digital? I wonder how many digital teams in the sector are aware of or thinking about this stuff? Would be interesting to know out of those that are doing some digital dev work now or in the near-future whether they considered RESS and what made them choose to go with it or not. Interesting discussion. I’m currently using mobile devices because my laptop broke, and am anxious to get my laptop mended/replaced because it’s difficult even to find & read info at times on a small mobile device. I remember the days when some websites expected one to choose which version one required according to device & level of expertise. I feel I’ve spent the last decade arguing constantly for making it straightforward for people to access information, in how content is organised, presented & written. I mentioned in a tweet one of my bugbears – essential info presented only in downloadable PDF format. For ages, even before I accessed websites via a mobile, my favourite browser on my laptop didn’t display these, so it was irritating to have to download, using up hard disk space for things I often didn’t want to keep, & open another programme in order to access information that was usually harder to read than if it had.been on a web page. The size of these files often makes me wince for those on a slow connection. Masses of dense text, in long paragraphs – in any format, for mobile, laptop or desktop – is tedious (unless it’s a book, perhaps). Structuring content well is good. I’ve always been in favour of keeping main menus as short as possible, but trying to keep key content accessible within 3or 4 clicks. I’ve been trying to get people to embed structured metadata for years (to the exasperation of some, I’m sure) because I still believe that this is a good way to retrieve meaningful content. There’s a big difference between a page or blog post being about, say, bus shelters and simply mentioning them in passing, and on a mobile device I can’t as easily scan the contents of a page as on a laptop to see if it’s the page I want. I see people on Twitter more often mentioning that they’re catching up on reading whilst commuting. – or even trying to write blog posts whilst on the train. bus etc. I think the number of people doing this will probably increase quite rapidly over the next couple of years. Yes, I understand that use of mobiles rather than laptops or desktops is high in deprived areas. This certainly happens in the North East. If you want people to acces your info or services, you do need to consider how to organise & present it as well as the content itself. No point in having beautifully written content if it’s not accessible to 30% or more people. Thanks for the link James – I’m off to have a read! I actually think that “mobile”, “tablet” or “desktop” content is the wrong way of looking at the problem. Along the lines of the Google research you cited, we need to start with context as the foundation for what kind of content support we’re going to provide. Google talks about Time, Goals, Location and Attitude as context elements. (At Axilent we’d talk about PAGE: Persona, Affinity, Goals and Environment – post about that here: http://www.axilent.com/blog/post/17/sensors-and-context/). What we need to build, are websites that infer the context of the user, including the technology they’re using to access, and make an editorial decision about what kind of content to provide. Just being on a mobile device may not be enough information – are they in a commute or at home on their couch? The difference may determine whether you see a summary or full version of a given content item. No, responsive design is not a distraction from good content. Many desktop site have lot of non-readable content. It is important to deliver to the end-user the content the he expects to see and read. Not the quantity is important, but the quality. In this case responsive design cannot be an impediment for this. It is just a technological solution, as devices take the form of phones, tablets, laptops, and a few dozen different screen sizes, resolutions, and ergonomic sizes. I also talk about how the data in the Google report needs some context adding to it – the data they give may look impressive but is not entirely clear when you read the full report. The blog post, by Malcolm Davison, uses a lot more of the data from this report to argue his case that reponsive design is a waste of time and resources because not enough people are using non-desktop devices to make it a worthwhile investment. I don’t agree with that stance – hence this post! I am all for the underlying technology of the website adapting what it serves (content or presentation) by what it, or we, know about any given user. In an earlier comment to Phil I’ve used a similar example to you on whether a user would see a summary or full version of any given content item. So, while I think we’ve phrased it differently I think we’re essentially looking at this in the same way!